Fabricland Flyer Canada - January 4 - 31, 2018-fashion velvet 60% off our reg . price our reg. $20 - $52 m selection will vary by store. huge selection solids, prints, burnouts!. glitz & glamour collections glam gal , glitter nigts, evening allure, baroque evenings large selection , individually priced. 50 - 65%off our original price. 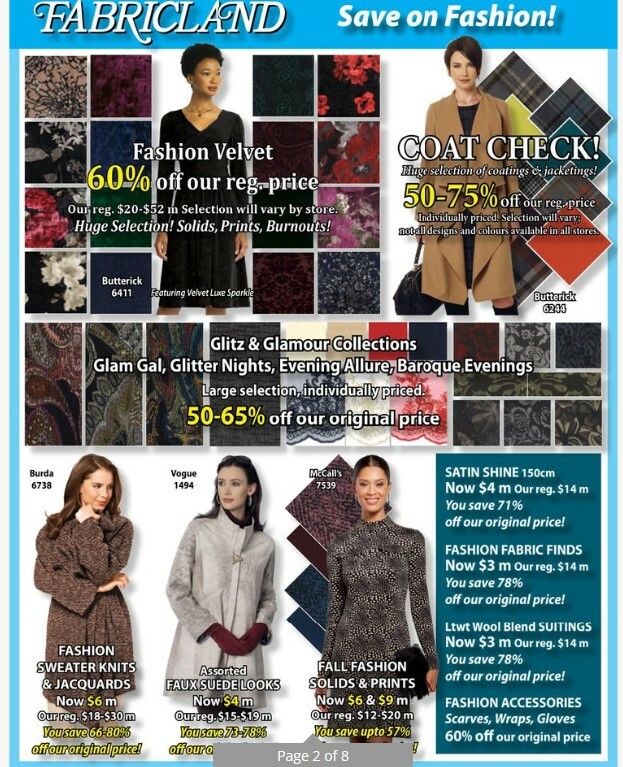 coat check huge selection of coating & jacketting 50 - 75% off our reg, price individual priced. selection will vary: not all designs and colour available in all stores. very plaid now $7 m our reg. up to $26 m 115 - 150cm widw. you save 52 - 73% off our original price!. brushed plaid 150 cm our reg .$15 & $20 m now $6 - $9 m you save 53 - 70% off our original price!. flannelette solids 140 - 160 cm our reg . $12 m now $4 m off our original price!. winter flanneltte prints our reg. $13 m now $6 m you save 53 % off our original price! creative craft prints our reg. $18 m now $6 m you save 66 %, off our original price!. double faced 7 bonded fleece 50 % our reg. price. christmaz collections 60% off our reguler price individuaally priced. festival holiday tabling selected prints plaids, jacquards. 50 - 75 % very plaid now $7 m our reg. up to $26 m 115 -150 cm wide. you save 52 - 73% off our original price! fleece collection huge ossortment of solids, prints , novelties. individual priced. now $5 $9 m you save up to 73% off original price! winter flannelette prints our reg. $13 m now $6 m you save 53% off our original price! creative craft print our reg. $18 m now $6 myou save 66% off save original price!.